Feiwel & Friends, 9781250065001, 112pp. Linda Liukas is a programmer, storyteller, and illustrator from Helsinki, Finland. 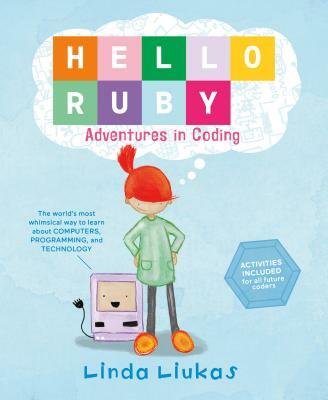 The idea for Hello Ruby first made its debut on Kickstarter and quickly smashed its $10,000 funding goal in just three and a half hours gathering $380,000 in total to become Kickstarter's most funded children's book. Linda is a central figure in the world of programming and worked on edutech before it was even called that. Linda is the founder of Rails Girls, a global phenomenon teaching the basics of programming to young women all over the world. The workshops, organized by volunteers in over 160 cities, have in a few years taught more than 10,000 women the foundations of programming. Linda has studied in business, design, and engineering at Aalto University and product engineering at Stanford University. She was selected as the 2013 Ruby Hero (the most notable prize within the Ruby programming community) and she's the Digital Champion of Finland, appointed by EU commissioner Neelie Kroes. She lives in Helsinki, Finland.